Some days work-in-progress happens not only on the bench but also under the bench, on the floor, and on and horizontal surface I can find. Today is such a day. This is my funky-yet-effective side-bender. 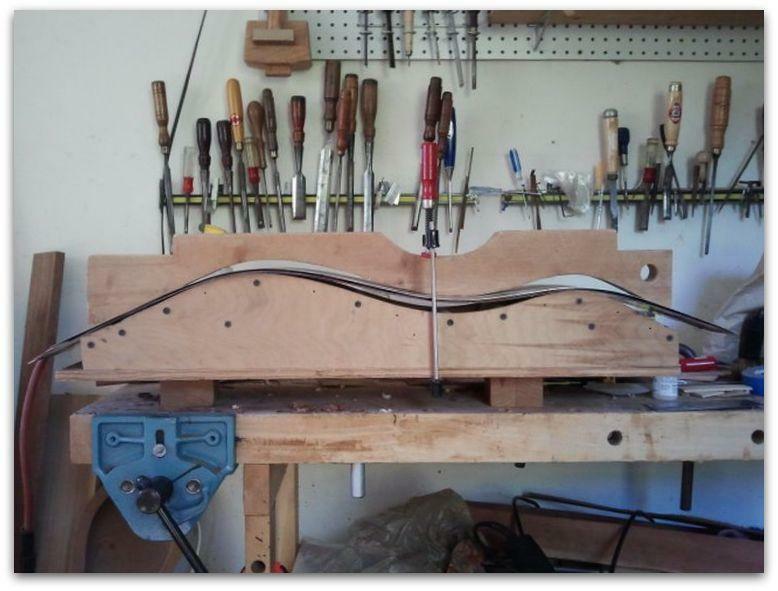 This bending form uses metal slats and a heating blanket to bend the sides for my standard model dulcimer. For one-of-a-kind instruments I bend sides the old fashioned way using a hot pipe. Inside the side bender are several pieces of rosewood about to become binding; the trim I sometimes use around the soundboard. The wood is moistened and as heat penetrates the wood I hear and smell when it will become pliable enough to bend under pressure. Many of us bend under pressure so I do not hold this against the wood. What I do hold against the wood are both the male and female halves of the bending form. I use three clamps to squeeze everything snug and then turn off the heat. I let the wood cool dry in the side-bender overnight. Wood has memory and will try to spring back to its original shape. Sometimes the binding or sides coming out of the side-bender need a little touch-up on the hot pipe to assure they hold the desired shape. Gary Gallier: I’ve done that too! The sprin back actually faired the curve better than my original design! Yep…exactly like mine. Leaving it to cool over night like you do does help with spring back. At one point I slightly adjusted the shape of my dulcimer to conform to the sides after they spring back. Yes..cheating. This just reminds me of how I shape my boiled wool, I use very hot water and then mold it to the shape I want, some times I pur it on the wig stand and sometimes I put it on a bowl! you don’t use the dining room table,do you?